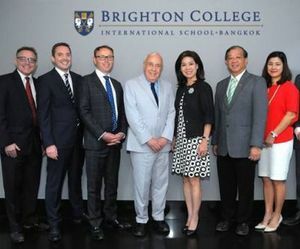 Nusara (Assakul) Banyatpiyaphod (Centre-right), Chairman of Hands Management Company Limited, together with Professor Lord Robert Skidelsky (Centre-left), Chairman of the Board of Governors of Brighton College recently convened the inaugural Board of Governors’ meeting of Brighton College International School, Bangkok. Joined by the other members of the Board, they discussed the strong partnership between Brighton College UK and Brighton College Bangkok, as well as the college construction and curriculum innovations which will be mirrored across the sister schools. Families interested to find out about Brighton College Bangkok’s world-class education and innovative curriculum should contact the Registrar at 02-136-7898 or admissions@brightoncollegebangkok.com. More information can be found online at www.brightoncollegebangkok.com.